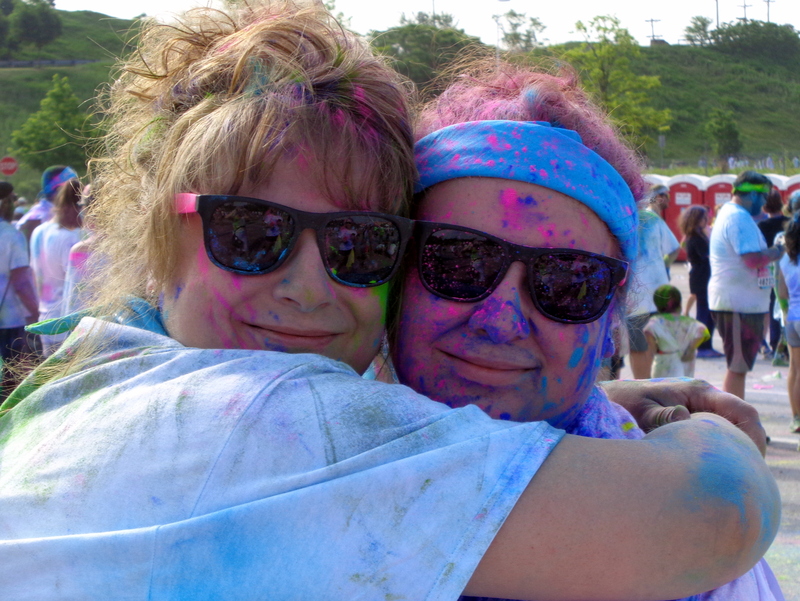 PITTSBURGH 5/30/2015 Who wants vivid rainbow colored dust thrown at them as they participate in a 5K run/walk? Apparently many people do, including my husband Monte, granddaughter Jordan, (17) and her cousin Taralee Haines, daughter, Sandy and her friends Aubrey Giles of Latrobe and Haley Conrad of Latrobe, and myself. 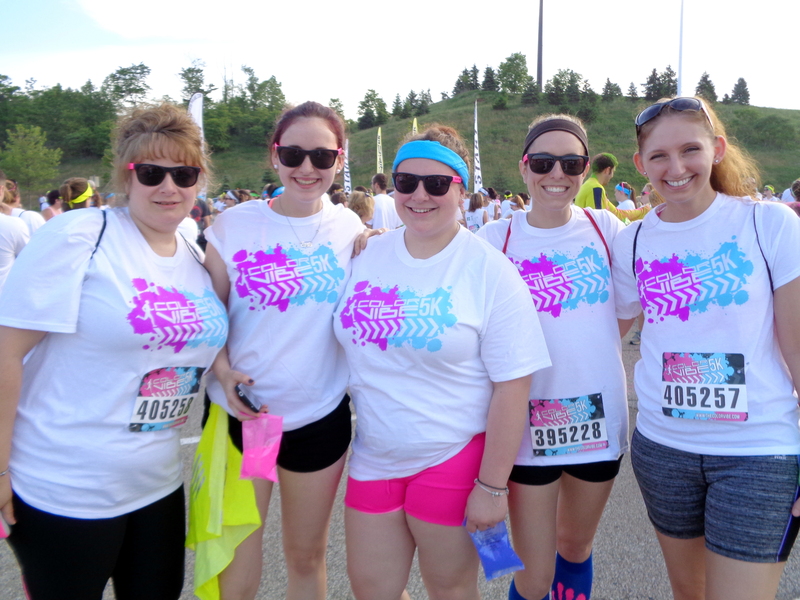 We were members of a Westmoreland County Community College nursing student team, organized by Aubrey, who participated in the Color Vibe 5K Run & Color Dance Party : Pittsburgh, at the Galleria at Pittsburgh Mills in Tarentum, Pennsylvania on May 30, 2015. 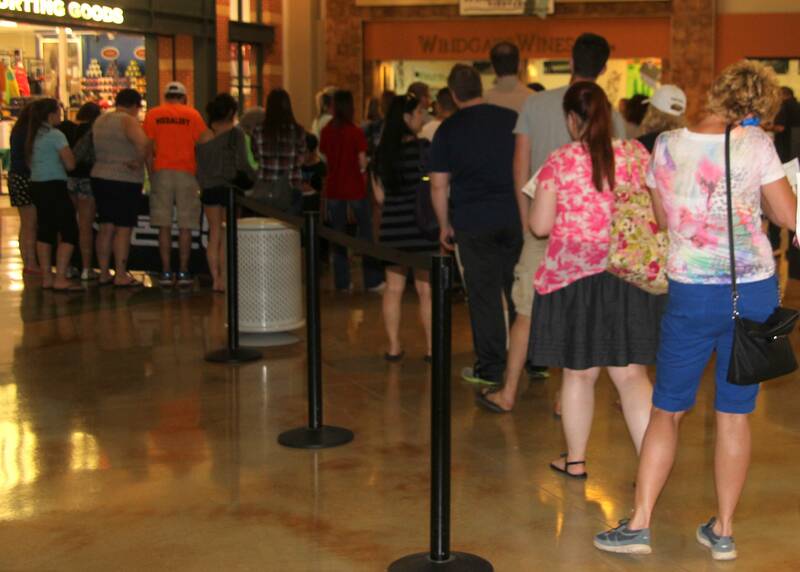 During the registration for the Saturday event I noticed my husband Monte and I were a minority in the crowd, being the only gray-haired persons in the long line of registrants. The woman ahead of us in line responded. “I’ll make certain they register you.” The few other gray-haired participants we observed on Saturday were much younger—say, in their 40s. May 30th dawned with a vivid sun-filled blue sky. Perfect for a 5K walk. 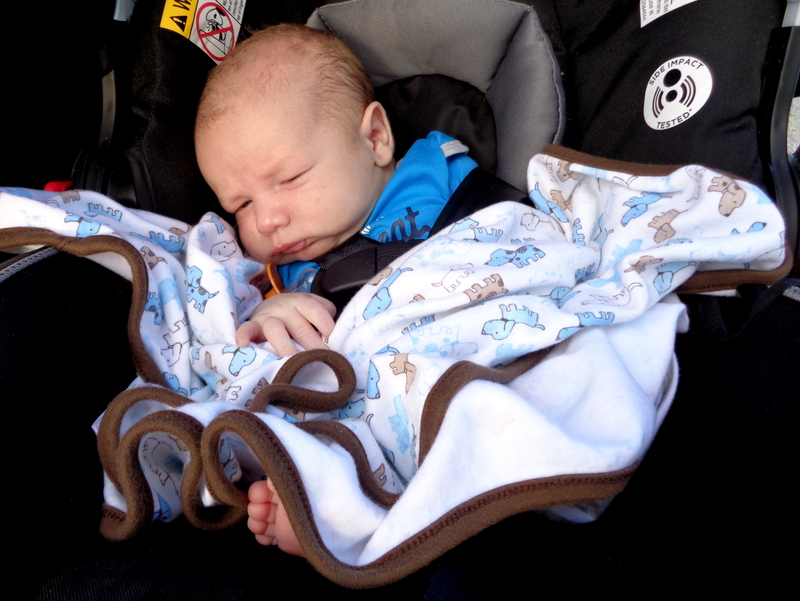 As we walked to the starting line I noticed what was perhaps the youngest “walker:” a month old baby. 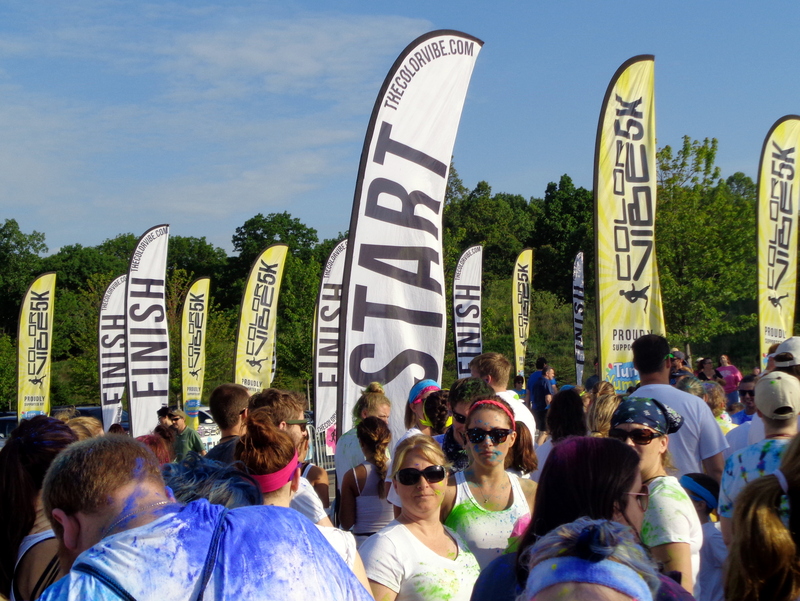 Color Vibe 5K Runs are for-profit events which partner with local charities and non-profit organizations, presenting them a portion of the proceeds based on the size of the event and the involvement of the charity. 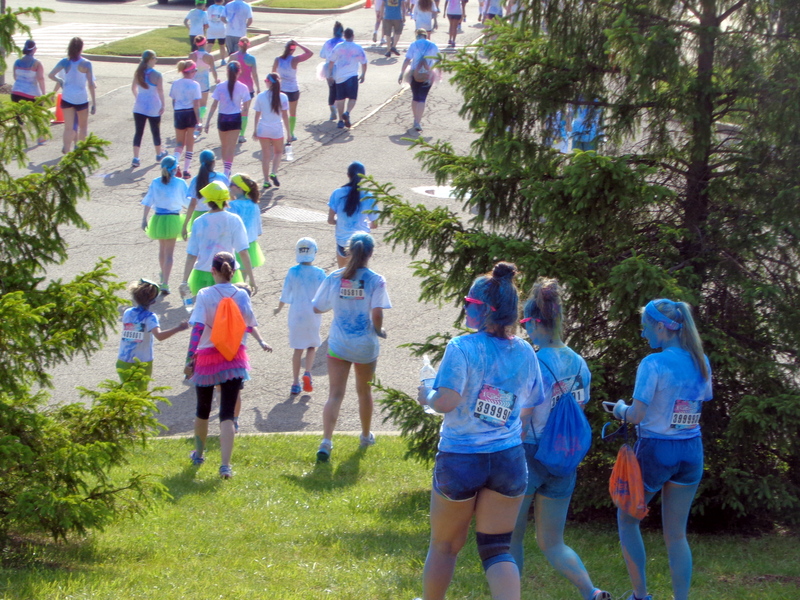 The charity chosen to benefit from the May 30th Pittsburgh Color Vibe 5K is Genesis House, a maternity care facility, located on a quiet residential street in Bellevue, PA. The facility, accommodate up to 8 women at a time, is for women who are pregnant over the age of 18 and in need of shelter. Its goal is to provide a self-help, home-like environment aimed at fostering a sense of responsibility and independence. 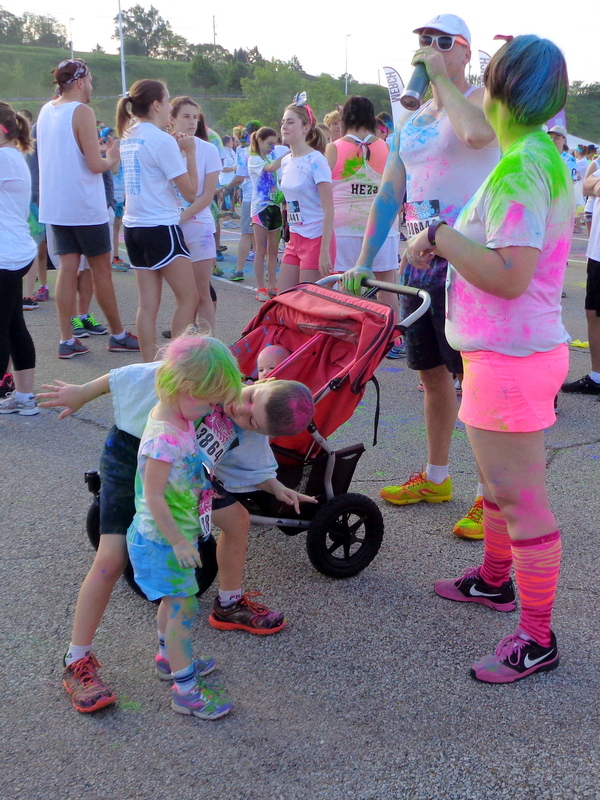 At each of the four color stations along the route—vivid pink, yellow, blue and purple—runners/walkers are blasted with a vividly colored non-toxic cornstarch powder. 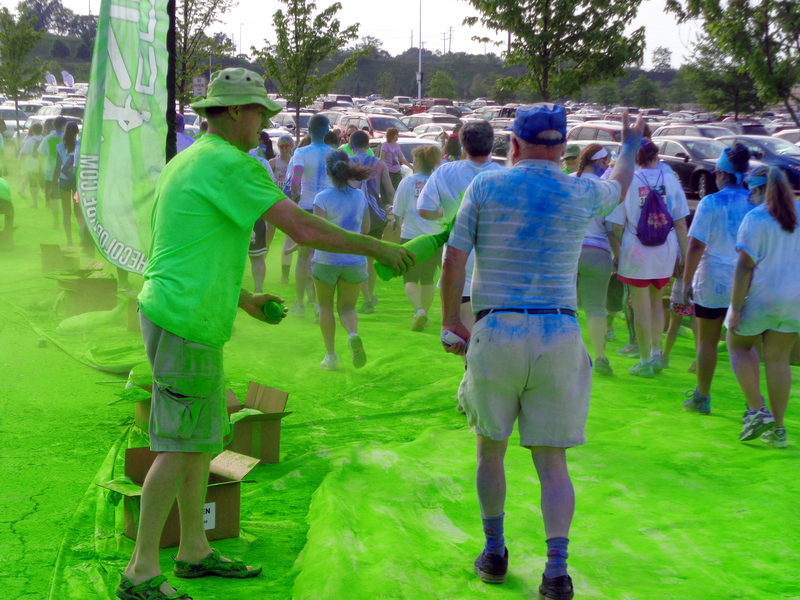 Thus, at the end of the race participants appear rainbow-like from head to toe. Participants are also provided a packet of cornstarch powder to sprinkle on their friends—or whoever. I chose purple, Monte chose yellow. All the members of our team completed the 5K walk. 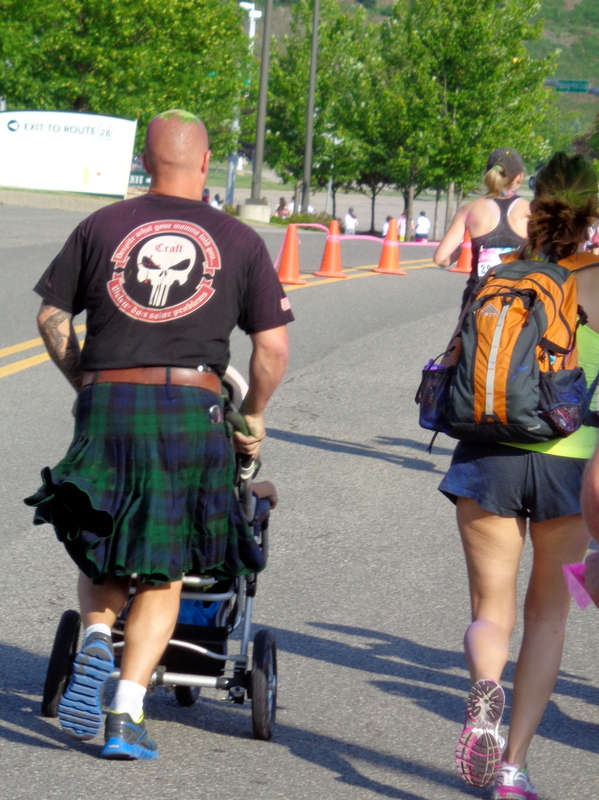 However, we saw numerous walkers cheating by cutting off corners. 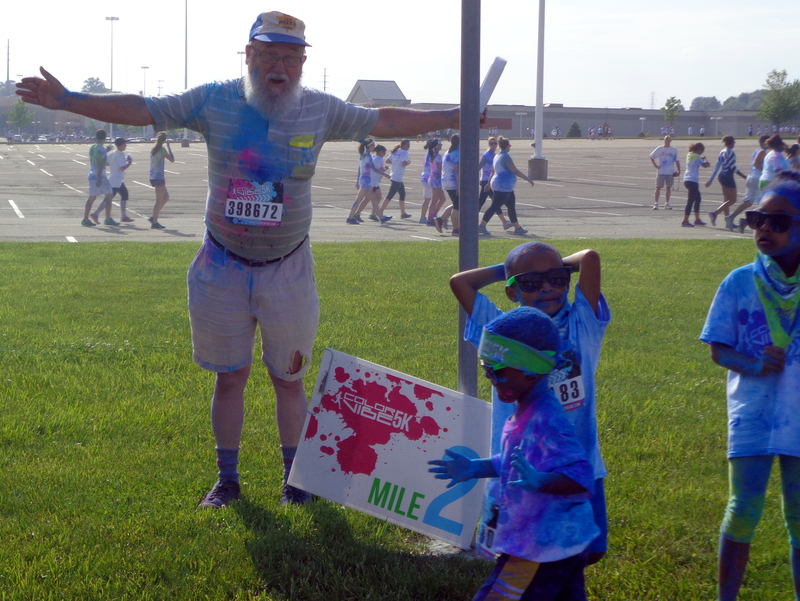 By the time we left we were no longer gray-haired seniors, but rainbow-haired participants covered in brilliantly vivid colors. The other team members were also vividly colored. NOTE: The WordPress photo challenge for June 5, 2015, is vivid. 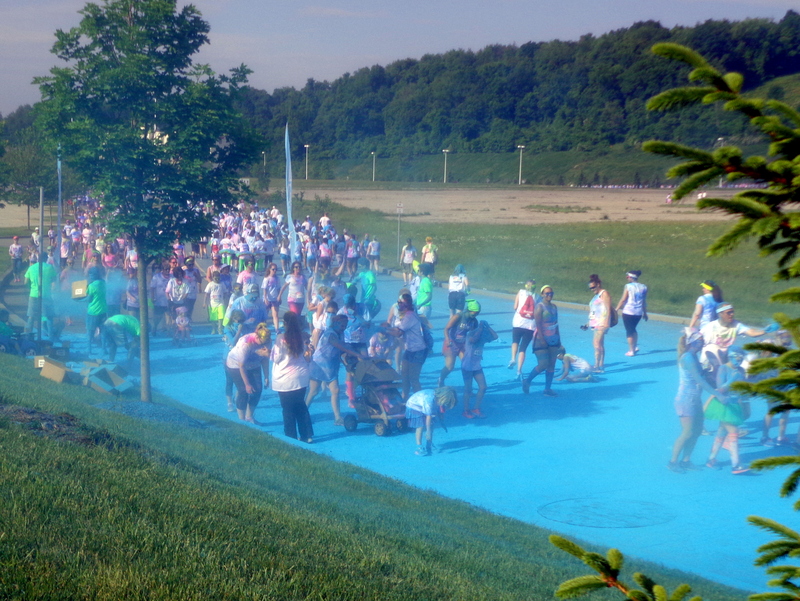 What can be more vivid than the appearance of Color Vibe 5K participants at the race finish line? 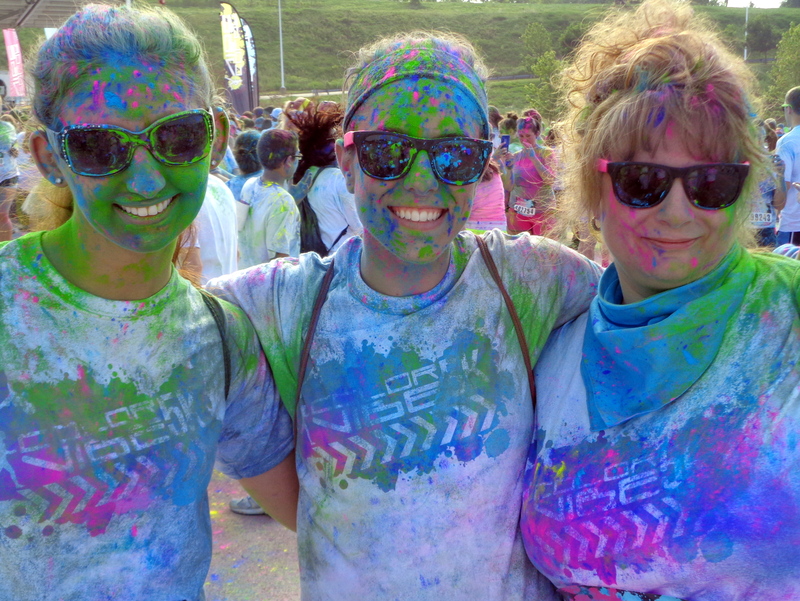 This entry was posted in JOURNAL/MEMOIR, Wordpress photos, WORDPRESS PROMPTS and tagged All posts, Color Vibe 5K Run & Color Dance Party: Pittsburgh 5/30/2015, DPchallenge 6/5/2015: vivid, dp_photo_challenge/vivid/, Genesis House: Pittsburgh, Journaling, Latest post, Life, Lifestream, Miscellaneous, postaday2015. Bookmark the permalink. This unusual fun event should be on the nationwide 6 o’clock headline news – much more interesting than all those crime stories.